Mangaluru, Oct 25, 2017: The Forum of Former Vice-Chancellors of Karnataka State Universities here on Oct 24, Tuesday urged the government to recruit teachers to enable State universities to offer quality education; the stress should be on autonomy. Addressing the inaugural session of a seminar on manpower planning in higher education at Mangalore University, president of the forum S.N. Hegde said that no new teachers have been recruited in the century-old University of Mysore for the last three decades. “Everyone knows what the universities need now. It is good teachers,” he said. Prof Hegde said that the forum would submit its recommendations to the government. It would be up to the government to take a decision. 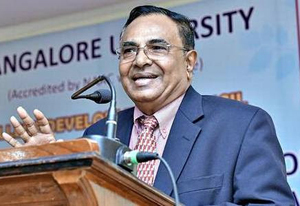 In his keynote address, Arjula Ramachandra Reddy, former Vice-Chancellor of Yogi Vemana University, Kadapa, said that the erosion of autonomy of universities has led to several complications in the higher education sector. Referring to recruitment issues, he said that the University Grants Commission (UGC) has no chairman, vice-chairman and secretary now. As many as 13 National Institutes of Technology (NITs) did not have directors till a week ago. In addition, 18 NITs do not have chairpersons for their boards. Dr. Reddy said that a situation has arisen now where recruitment of teachers in universities is being challenged in courts. He questioned the need for 64 bodies controlling the higher education sector. Those bodies do not have proper understanding among themselves. “Why [should we] lose trust in universities. Why [are there] multiple regulatory bodies controlling higher education?” he asked. He said that the universities were meant for generating knowledge and not manpower. Higher education in the country was now shifting from public good to private good. He said that the universities were now enrolling “customers” and not students due to commercial interest. Prof . Reddy said that admissions of students to private universities and colleges were growing now and it was declining to government-controlled and sponsored universities. K. Byrappa, Vice-Chancellor, Mangalore University, spoke. A good teacher is very important for every student and in every institution ..